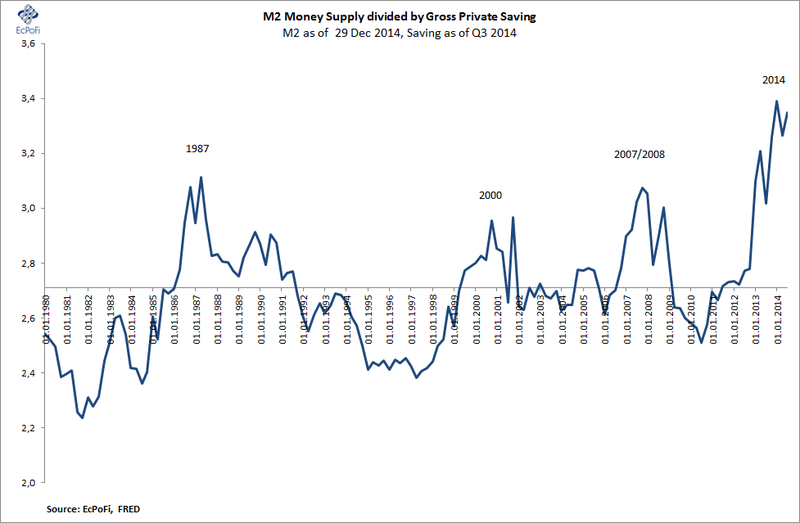 As the Fed has ended QE3, it's been the banks' responsibility to maintain and increase the money supply growth rate. So far, they've certainly done their bit. According to the latest data from the Federal Reserve, Bank Credit growth increased 8.4% compared to same week last year - the biggest expansion since October 2008. 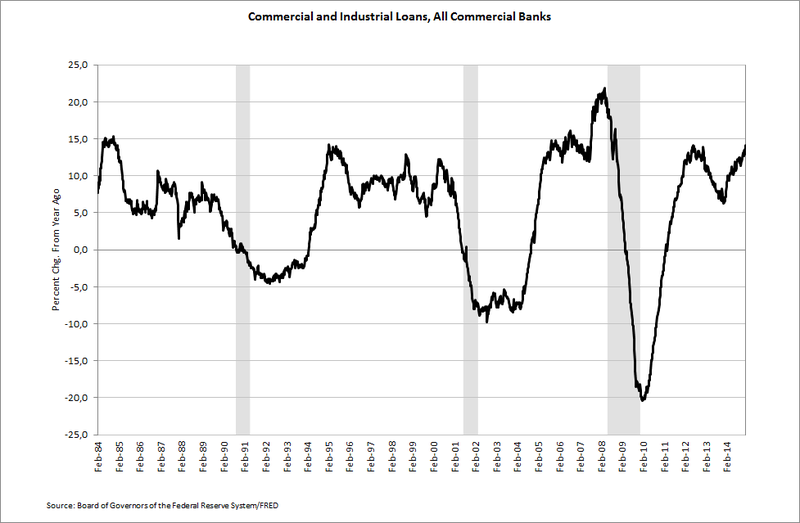 The expansion was driven by a 14.1% y/y growth in Commercial & Industrial loans, a growth rate last seen in November 2008 and in line with previous peak growth rates (ok, it does come from a low level this time around). The continued bank credit boom explains why the money supply growth rate has been holding up reasonably well despite the Fed taper throughout 2014 culminating with the end of QE3 in October last year. 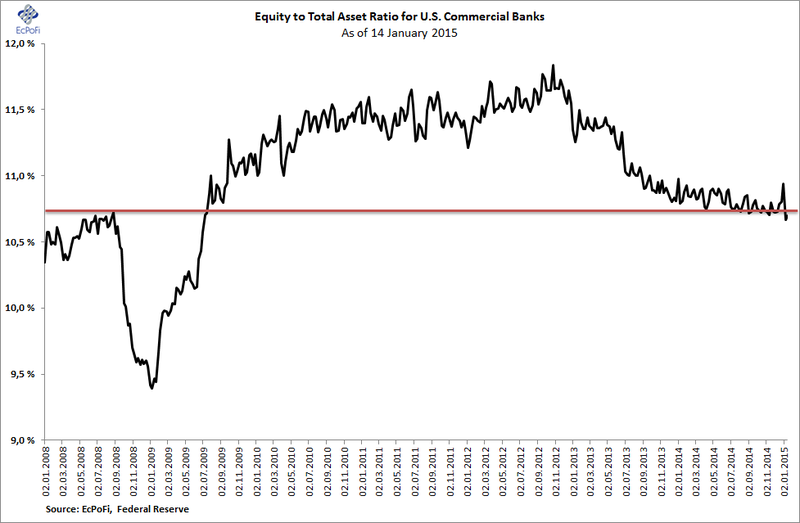 This credit expansion cycle will however ultimately end badly, too. For now, it could help to further fuel the artificial U.S. economic recovery. 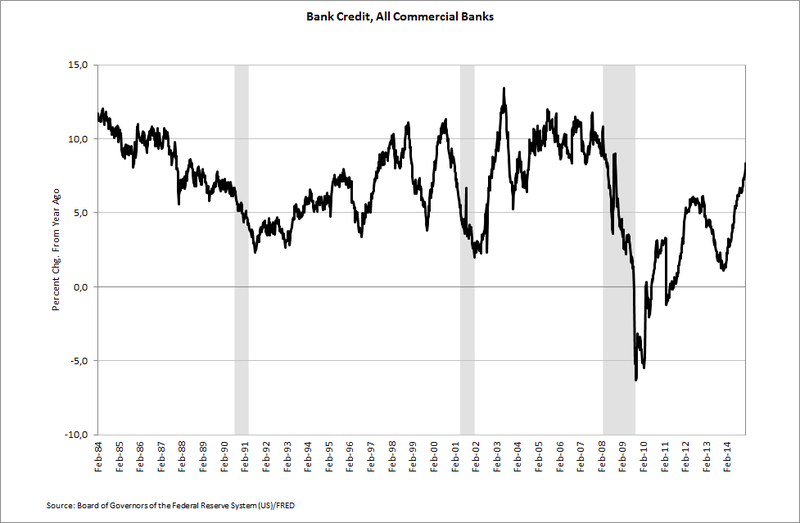 It is nothing short of extraordinary that the Fed, regulators and politicians have already forgotten, or still ignore, what brought about the banking crisis and economic bust in 2008: aggressive bank credit and money supply growth orchestrated by poorly capitalised banks. The lesson? Real economic growth is brought about by production, savings and investments and not by debt expansion (money supply growth), over-consumption and stock market speculation. Artificial growth does not last forever. In fact, it must eventually come to an end, usually of the disastrous kind.